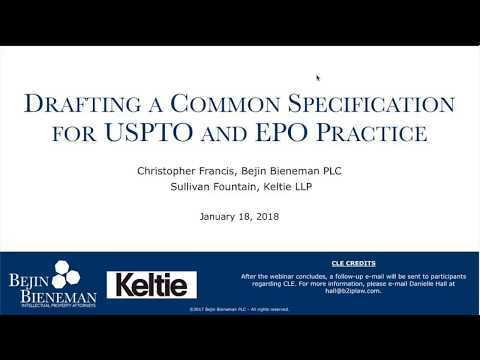 Chris Francis of Bejin Bieneman PLC and Sullivan Fountain of Keltie LLP discuss drafting a common specification for filing and prosecution in both the USPTO and the EPO. The discussion includes comparison and contrast between USPTO and EPO practice on the topics of claim drafting, description drafting, and prosecution. These topics are accompanied by practice pointers and considerations for drafting a single patent application for effective and efficient filing and prosecution before both Offices.